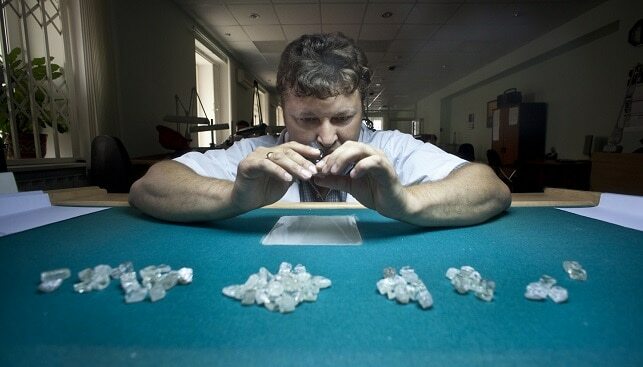 Russian mining giant Alrosa has reported a total revenue of $463 million from 32 international auctions it held for special size (over 10.8 carats) rough diamonds in 2018. 11 auctions – the largest number of auctions in 2018 – was held in Moscow, and four were held in Vladivostok. Two auctions were held at Alrosa’s sales office in New York, which resumed operations in 2018. Six auctions took place in Ramat Gan, three in Hong Kong, four in Dubai and two in Antwerp. In 2019, Alrosa plans 37 international auctions, increasing the number of auctions in Antwerp, New York and Dubai. There will be still 11 auctions in Moscow and four in Vladivostok, four in Antwerp, five in Dubai, six in Ramat Gan, three in in Hong Kong and four in New York. Evgeny Agureev, Director of the United Sales Organization at the company, commented that each of Alrosa’s auctions in 2018 had up to 100 participants and that the company is “in general pleased” with the results.